Speaking of CT's various lines, one has not been mentioned: the upcoming New Haven Line service to Penn Station. Surely the state will need to find more rolling stock to serve this extension as well. I wish they would be more forthcoming with their service plan so we could have a better sense of how service to Grand Central will change when this project comes online. I can't believe that the current M8 fleet will be sufficient to serve both branches. And how do bi-levels fit in to all of this? I don't believe the plan is to add trains to NYP, but rather to route some there instead of GCT. I think the idea is to trade the slots with the ones LIRR's sending to ESA. Don't expect any service to NYP in a long time, Amtrak wants MTA to pay for several upgrades to hellgate line with some like pelham bay bridge costing in Billions of dollars. You can also safely rule out coaches for that service, as Amtrak is very hesitant on push pull and requires adding a locomotive at each end of a train and that will be prohibitively expensive. The trains going to ESA would basically be trains that currently not go to manhattan, but connect with ferries or terminate at Jamaica. dha10001 wrote: Speaking of CT's various lines, one has not been mentioned: the upcoming New Haven Line service to Penn Station. Surely the state will need to find more rolling stock to serve this extension as well. I wish they would be more forthcoming with their service plan so we could have a better sense of how service to Grand Central will change when this project comes online. I can't believe that the current M8 fleet will be sufficient to serve both branches. And how do bi-levels fit in to all of this? Yes the New Canaan shuttle trains, indeed operate with six cars, daily. In fact, it happens on other lines where MNR will run six car shuttle trains. I have ridden on a few Maxi-Shoreliner sets on the Upper Harlem shuttles. If there happens to be one of those sets available to cover a shuttle train when three car sets aren't available, then it is needed to help transport people. NJT's NJCL shuttles operate with six cars daily and probably during the summer, there are seven car sets running on them too. As for the proposed MNR service running on the Hellgate Line; yes, probably the majority of the trains will operate between NRO and NYP and they will be M8 sets. Even though their might be a few stops planned, it doesn't mean that the trains won't be filled up fast from the start of its origin. Having regular MNR service on the Hellgate Line will open up so many doors to people who are not just traveling to Manhattan but also plenty of people who live in the Bronx who might work in New Rochelle and even Stamford. Why is there a misconception that New Canaan trains can and should still be run as a two car dink? Two car MU trains are not even allowed by time table anymore, due to detection of signal system/crossings. there has not been a two car dink for at least 14 years. but enough tread drift , hellgate ? new Canaan, subject was coaches . Great ,now a 2 pair minimum just to run the New Canaan Shuttle, should have kept a small pool of triplets in service! of MLV III's are built and delivered by BBD. I guess we’re kind of on fleet needs, let’s just remember that when discussing things like SLE, CTRail/Hartford, New Canaan and Hell Gate. 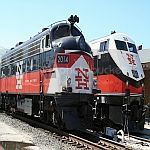 GirlOnTheTrain wrote: Why is there a misconception that New Canaan trains can and should still be run as a two car dink? Just brought it up as an idea to get cars for the Hell Gate service. I don't think a 2 or 3 car set covering off-peak and weekend runs on the New Canaan shuttle is that outrageous. Emphasis on OFF PEAK. Have to admit I haven't ridden that particular train in a couple years but unless ridership has increased exponentially since 2015 the, say, 2:28 pm departure from New Canaan on a Wednesday isn't filling up 6 cars between there and Stamford. That said I wasn't aware that a short train would screw with the grade crossing circuits. Where is the information to support the claim that MN/ConnDOT are buying multilevel coaches? Let alone from Bombarder? The Lets Go CT site states only that the state is pursuing a single-level coach order for the branch lines. And I think Penn Station Access will very likely be realized. As far as I know the project already has $600+ in approved funding and broad political support from NY and CT pols. If the project was going to be put on ice we wouldn't be reading articles about the pols pressuring amtrak to come to an agreement. And therefore they are gonna need more rolling stock, sooner or later. ConnDOT's add on M-8 order is inline with other orders at Kawasaki's Factory at Lincoln Ne. ConnDOT is partnered with MN and LIRR on the next Dual mode loco to replace the P-32DM. ConnDOT will partner with MN and LIRR on the next order of bi-level coaches/cabcars based on the MLV car design used by NJT. That design is OK'ed to enter GCT(Will be "known" as "Shoreliner 5/C-5 on LIRR). CDOT will get more used coaches for SL fleet. They have a habit of geting used old junk for their low mileage, low duty cycle branches and "not NY" service. MN/MTA probably wouldn't accept maintenance on used coaches, or allow them into GCT (assuming enough DMs) anyways since their MTBFs would reflect badly on their KPIs. NJT will be releasing more of their Comet fleet when EMU MLVs come, I think that will be the source of CDOT's future SL cars.